Time to impress customers with a business gift that will look simple stunning on your customer's desk. Our latest Weather Station with Logo is the ideal tool to ensure your corporate brand name and crest is visible to customers and clients regardless of the weather! With its push-button light on its top surface, it is user friendly to operate and displays the time, temperature and humidity in a colourful lcd display. 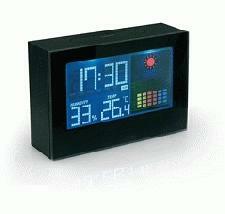 Customised for your customers and given as a business gift, you can't go wrong with this Weather Station with Logo.